Lady Bird Lake (formerly, and still colloquially referred to as Town Lake) is a river-like reservoir on the Colorado River in Austin, Texas, United States. The City of Austin created the reservoir in 1960 as a cooling pond for a new city power plant. The surface area of the lake is 416 acres (168 ha), and it is currently used primarily for recreation and flood control. The reservoir is named in honor of former First Lady of the United States Lady Bird Johnson. View from Lady Bird Lake toward Downtown Austin. Lady Bird Lake is the easternmost lake of a chain of reservoirs on the Colorado River, which is completely located in Texas, and should not be confused with the larger Colorado River located in the Southwestern United States. This chain, known locally as the Texas Highland Lakes, also includes Lake Buchanan, Inks Lake, Lake LBJ, Lake Marble Falls, Lake Travis, and Lake Austin. Longhorn Dam impounds Lady Bird Lake. The City of Austin constructed Longhorn Dam in 1960 to form Town Lake. The city needed the reservoir to serve as a cooling pond for the Holly Street Power Plant, which operated from 1960 until 2007. Before 1971, the shoreline of Town Lake was mostly a mixture of weeds, unkempt bushes, and trash. Local television station KTBC referred to the lake as an "eyesore". Some concerned Austinites had tried to clean up the lake, but the effort was only partly successful. During his two terms in office (1971–75), the Mayor of Austin Roy Butler led the Austin City Council to establish the Town Lake Beautification Committee, and he appointed Lady Bird Johnson as the project's honorary chairman. Johnson's involvement brought attention and money (including $19,000 of her own) to the Town Lake project, allowing for the planting of hundreds of shrubs and trees. The city also built a system of hike and bike trails along the shoreline of the lake. On July 26, 2007, the Austin City Council passed a controversial resolution authorizing the renaming of the reservoir from Town Lake to Lady Bird Lake in honor of Lady Bird Johnson, who had died earlier that month. Johnson had declined the honor of having the lake renamed for her while she was alive. In renaming the lake, the City Council recognized Johnson's dedication to beautifying the lake and her efforts to create a recreational trail system around the lake's shoreline. In 2009, non-profit organization Keep Austin Beautiful launched "Clean Lady Bird Lake". The program mobilizes thousands of community volunteers annually to conduct large-scale cleanups along the lake every other month and targeted cleanups throughout the year. View of Lady Bird Lake and the Downtown skyline seen from the East Riverside neighborhood. Lady Bird Lake is a major recreation area for the City of Austin. The lake's banks are bounded by the Ann and Roy Butler Hike-and-Bike Trail, and businesses offer recreational watercraft services along the lakefront portion of the trail. Austin's largest downtown park, Zilker Park, is adjacent to the lake, and Barton Springs, a major attraction for swimmers, flows into the lake. The City of Austin prohibits the operation of most motorized watercraft on Lady Bird Lake. As a result, the lake serves as a popular recreational area for paddleboards, kayaks, canoes, dragon boats, and rowing shells. Austin's warm climate and the river's calm waters, nearly 6 miles (9.7 km) length and straight courses are especially popular with crew teams and clubs. Along with the University of Texas women's rowing team and coeducational club rowing team, who practice on Lady Bird Lake year-round, teams from northern universities (including the University of Chicago, the University of Oklahoma, and the University of Nebraska) train on Lady Bird Lake during Christmas holidays and spring breaks. Other water sports along the shores of the lake include swimming in Deep Eddy Pool, the oldest swimming pool in Texas, and Barton Springs Pool, a natural pool on Barton Creek which flows into Lady Bird Lake. Below Tom Miller Dam is Red Bud Isle, a small island formed by the 1900 collapse of the McDonald Dam that serves as a recreation area with a dog park and access to the lake for canoeing and fishing. Swimming in Lady Bird Lake is illegal due to poor water quality from the run-off from area streets and debris in the water from bridges and dams destroyed by floods in years past. The City of Austin enacted the ban in 1964, and the fine can be up to $500. Music venues on the banks of Lady Bird Lake are home to a number of events year-round, including the Austin City Limits Music Festival in the fall, the Austin Reggae Festival and Spamarama in the spring, and many open-air concerts at Auditorium Shores on the south bank and Fiesta Gardens on the north bank. The Austin Aqua Festival was held on the shores of Lady Bird Lake from 1962 until 1998. The late Austin resident and blues guitar legend, Stevie Ray Vaughan played a number of concerts at Auditorium Shores and is honored with a memorial statue on the south bank. Many Austinites take advantage of the Butler Trail to keep fit by walking, running or cycling. 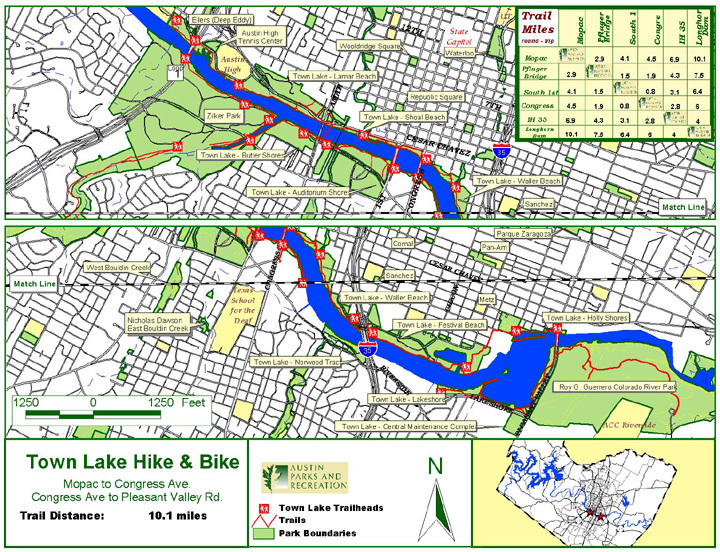 The Ann and Roy Butler Hike-and-Bike Trail, formerly the Town Lake Hike and Bike Trail, creates a complete circuit around Lady Bird Lake. It is one of the oldest urban Texas hike and bike paths. The trail is the longest trail designed for non-motorized traffic maintained by the City of Austin Parks and Recreation Department. A local nonprofit, The Trail Foundation, is the Trail's private steward and has made Trail-wide improvements by adding user amenities and infrastructure including trailheads and lakefront gathering areas, locally-designed jewel box restrooms, exercise equipment, as well as doing trailwide ecological restoration work on an ongoing basis. The Butler Trail loop was completed in 2014 with the public-private partnership 1-mile Boardwalk project, which was spearheaded by The Trail Foundation. The trail is 10.1 miles (16.3 km) long and mostly flat, with 97.5% of it at less than an 8% grade. The trail's surface is smooth and is mostly crushed granite except for a few lengths of concrete and a boardwalk on the South-side of the lake. A pedestrian bridge incorporated into the trail bridges Barton Creek. The Roberta Crenshaw Pedestrian Walkway spans Lady Bird Lake beneath MoPac Boulevard and provides the trail's westernmost crossing of Lady Bird Lake. Lady Bird Lake has been stocked with several species of fish intended to improve the utility of the reservoir for recreational fishing. The predominant fish species in Lady Bird Lake are largemouth bass, catfish, carp, and sunfish. Fishing is regulated, requiring a fishing license, and daily bag and length limits apply for most species. A ban on the consumption of fish caught in the lake was issued by the City of Austin in 1990, as a result of excessively high levels of chlordane found in the fish. Although the use of chlordane as a pesticide was banned in the United States in 1988, the chemical sticks strongly to soil particles and can continue to pollute groundwater for years after its application. The ban on the consumption of fish caught in the lake was finally lifted in 1999. The first water treatment facility in the City of Austin, the Thomas C. Green Water Treatment Plant, was built in 1925 to treat water from the Colorado River. The plant occupied 6 acres (2.4 ha) just west of the principal downtown business district. The water treatment facility was decommissioned in late 2008. ^ "Lady Bird Lake". Handbook of Texas Online. Retrieved December 30, 2010. ^ "Holly Street Power Plant is Retired" (PDF). Austin Energy Customer News. Austin Energy. Retrieved April 9, 2013. ^ a b "Former Austin Mayor Roy Butler Has Died". KTBC. November 13, 2009. Retrieved December 19, 2009. ^ Wear, Ben. "Lady Bird helped turn Town Lake into town treasure". Austin American-Statesman, July 13, 2007. pA1, A6. ^ Raskin, Amy (2007). "Austin changes Town Lake name to Lady Bird Lake". Houston Chronicle. July 26, 2007. ^ Wilson, Janet (2007). "Lady Bird Johnson dies at 94" Archived February 19, 2012, at the Wayback Machine. Austin American-Statesman. July 12, 2007. ^ Barnes, Michael (May 20, 2013). "Volunteer Linda McCoy-Shriever fights cancer and cleans up creeks". Austin American-Statesman. Retrieved 22 February 2017. ^ Strickland, Barbara (November 28, 2013). "Keep Austin Beautiful Looking For Volunteers To Clean Up Lady Bird Lake". austinist.com. Retrieved November 20, 2015. ^ "Clean Lady Bird Lake". Keep Austin Beautiful. Retrieved 22 February 2017. ^ Ellis, Luke (2006). "The Common Law: Boating on Town Lake – What's the Law?" March 17, 2006. ^ Largey, Matt. "Yup, It's Still Illegal to Swim in Lady Bird Lake. Here's Why". kut.org. KUT. Retrieved 7 June 2017. ^ "The Boardwalk Trail at Lady Bird Lake". City of Austin. Archived from the original on May 4, 2015. Retrieved November 20, 2015. ^ Texas Environmental Almanac . "Water Quality". Texas Environmental Almanac. ch. 2, p. 6. ^ Texas Parks and Wildlife Commission (1999). "Regulations Committee Meeting". Commission meeting transcript. November 17, 1999. ^ City of Austin (2008). "Green Water Treatment Plant Decommissioning Ceremony Tuesday". Press Release. December 15, 2008. Wikimedia Commons has media related to Lady Bird Lake.